Guess what Rays fans? I have a great frugal family night for you! 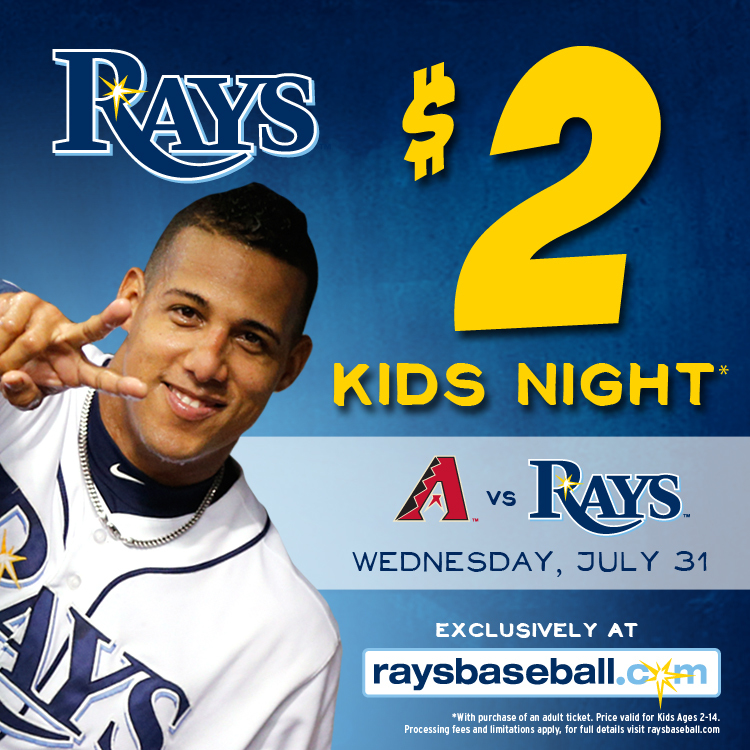 On Wednesday July 31st, 2013 the Tampa Bay Rays are hosting $2 Kids night. With the purchase of each regular priced adult ticket you can buy up to three kids tickets for only $2 each (ages 2-14). Tickets are available in the Lower Reserved, Press Level Reserved, Baseline Box, Upper Reserved and tbt* Party Deck. So, you have several different price options and locations available. I recommend the Upper Reserved tickets in sections 310, 312 or 314. That is where we sit when we are buying cheaper tickets. I love the view of the stadium from these seats! In addition the Rays will have free parking for cars that have 4 or more people. You can really go to the Rays game for cheap with this special. This deal is available exclusively online, so you will have to pay small ticket fees. I did a price scenario for you to give you an idea of what this will cost you out of pocket. This is for 2 adults and 2 kids in section 310, but it will give you an idea of how frugal this night could be. TOTAL FOR FAMILY OF FOUR: $28.50!! That is WAY cheaper than going to see a movie and much more entertainment in my opinion. Don't forget that you are allowed to bring in some food and sealed water bottles (read about a previous Rays game and more Rays Money Saving Tips in my previous post). The Rays also have all you can drink sodas for purchase (with a souvenir cup). I hope to see you at the ball game.